After my husband discovered that regular charcoal in fact does contain coal, in addition to other nasty byproducts, he switched exclusively to lump hardwood char. That can be difficult to find around here, and is more expensive than regular charcoal. So he decided to learn how to make his own char from wood trimmings we had after we cut down a large tree in the backyard. He has discovered that the flavor of REAL hardwood char is superior even to manufactured lump hardwood (which is mostly wood floor and pallet trimmings). The most important thing to remember when making your own char is to be certain that the outside of the wood is completely charred, as in total carbon black, otherwise you are cooking with soot or creosote. My husband usually starts with with oak or maple branches with a wrist-sized diameter and cut to fit the length of the firebox. (I have seen some websites that recommend chunks no larger than 5-6 inches, but we have a pretty big firebox). To make your own, find some wood, cut it into the biggest chunks that will easily fit in your smoker or grill, and fill your firebox pretty full. You want to layer the wood criss-cross style for maximum exposure to flame and air during the beginning phase to be sure that it all chars evenly. This means you will be able to see light through to the bottom of the stack. My husband prefers to ignite the wood with a MAPP gas or propane torch rather than soaking it in lighter fluid so it doesn't have any off-odors or noxious gases. You could also do it kind of like a chimney, by placing wadded paper underneath and lighting the paper until the wood catches. It takes a lot longer to do that, though. 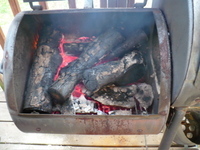 Once it's lit, leave the fire uncovered and burning vigorously until all the wood is completely charred on the outside. Now comes the critical step. Close the lid, close the dampers, close any vents. This allows the wood to burn with no oxygen. 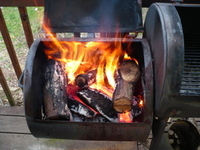 This consumes the wood and leaves the char. 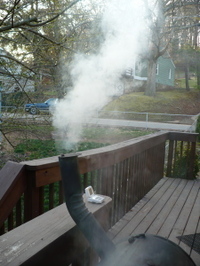 In the beginning of the process, a lot of smoke will be produced, which is actually the water being steamed out of the wood. It's our way of sending smoke signals to the neighbors so they know we'll be having some tasty pork and/or beef later in the day. When it looks like glowing orange coals, rather similar to regular charcoal, it's ready to be used for cooking. This usually takes about an hour to an hour and a half in our firebox. If the chunks of wood are big enough, you can keep a medium-sized smoker can at 400 degrees for several hours just by regulating the vents/damper. When you are ready to smoke or grill, open up the damper and chimney vent to allow air to flow, thereby increasing the temperature of the grill. If you are grilling you can grill directly over the coals, or you can smoke with an offset or vertical smoker box. You don't want to add fresh wood to this fire (to avoid soot), so if you have to add fuel to keep the heat up, it's best to add manufactured lump hardwood char. You can add small pieces of raw wood for flavoring, but don't add large chunks for fuel/heat. Just as with charcoal, this will burn until nothing is left but ash. We use the ash in the cracks of our driveway to keep weeds from growing. It's quite alkaline, and most plants will not tolerate a highly alkaline soil. It's better for the environment than weed killer and just as effective. I know about the other nasty by products, but what is the down side of coal?